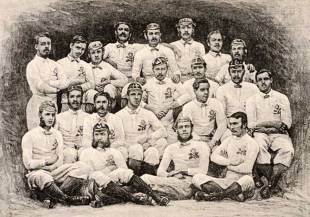 The first rugby international resulted from a challenge issued in the sporting publication Bell's Weekly on December 8, 1870 and signed by the captains of five Scottish clubs, inviting any team "selected from the whole of England" to a 20-a-side game to be played under the Rugby rules. Nine months earlier a similar challenge had resulted in the first Association football international, against between England and Scotland, at The Oval. The challenge was ignored by the football fraternity, but Blackheath, one of London's oldest clubs who played the Rugby code, accepted and set about raising a team. The England side, a far from representative group, was led by Frederic Stokes of Blackheath, while Scotland, who held two trial matches, were captained by Francis Moncrieff; the umpire was Hely Hutchinson Almond, headmaster of Loretto College. England played in all white, with a red rose on their shirts; Scotland wore blue shirts and white cricket flannels. 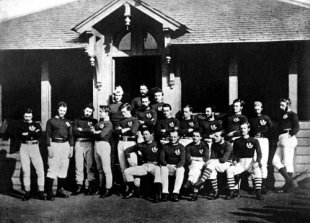 On March 27, 1871, the teams met at Raeburn Place, Edinburgh, the home ground of Edinburgh Academicals. More than 4000 spectators paid one shilling each to watch. The game itself was played over 50-minute halves, and Scotland won by virtue of the only goal of the match, Angus Buchanan scoring the try which was converted by William Cross. Although both sides went on to score again, under the rules of the day the only value came if the conversion was successful - the try was nothing more than a means of scoring a goal, a legacy of the Association roots. While there was clarity on that rule, others were vaguer and led to several disputes. At the time there was no universally accepted rulebook and they varied from club to club and usually had to be agreed beforehand. The second Scottish try was a case in point, as John Arthur knocked the ball on over the English try-line and fell on it. The try was awarded as that was within the local rules, but very much against what was played in the south. A possible escalation of the row was avoided as the conversion was missed. England returned home chastened as there was little awareness that Rugby was flourishing in Scotland. Had they done their homework then they would have known that at the time it was more popular than Association football. In Scotland, the win was greeted with enthusiasm and the match ball was put on display in a local shop for several weeks.